World 8- Ghost House 2 is the fifteenth course of World 8 in Puzzle & Dragons: Super Mario Bros. Edition. 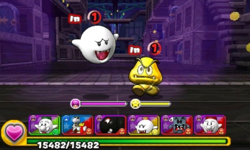 It is a ghost house level with enemies consisting of Boos, Purple Coin Coffers, and Big Boos. This course is unlocked by taking the secret exit in World 8-11. This level starts with four battles (with two Purple Coin Coffers appearing on the third battle), after which the player reaches a branching path with a sign on the left, a Gold Block in the center, and a green Warp Pipe on the right. The path on the right requires the player to clear more Fire Orbs than other Orb types, the Gold Block in the center requires more Dark Orbs to produce its Beanstalk, and the green Warp Pipe on the right requires more Wood Orbs to be cleared to enter it. Taking the path on the right, the player faces three battles before the boss fight with Boo Crew. Taking the green Warp Pipe down, the player faces a battle with a King Boo, then comes across a ? Block they can open for an item. After opening (or failing to open) the ? Block, the player takes a blue Warp Pipe back to the main path and directly to the boss fight at the end. Climbing the Beanstalk produced by the Gold Block in the center, the player faces two battles before taking a blue Warp Pipe back to the main path and directly to the boss fight at the end. The player has Fire, Water, Wood, and Dark Orbs on the Orb field for this course. ★World 8- Ghost House 2 is a difficult version of World 8- Ghost House 2 from ★World 8. The Orb configuration for this Special World course matches that of its normal world counterpart. 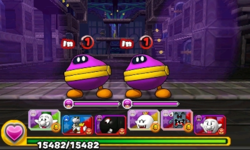 The third battle contains three Purple Coin Coffers instead of two. A rare Gold Goomba sighting in the first battle. Another rare Gold Goomba sighting in the first battle. A rare Gold Goomba sighting in the sixth battle. This page was last edited on August 15, 2017, at 23:09.